The Popular Committee, who is representing the Ni’lin municipality, political parties, institutions and organizations in Ni’lin, has not been in any discussions with any Israeli army commanders and has not made a promise to the Israeli army that there will be no more protests. right to protest against the confiscation of their land. 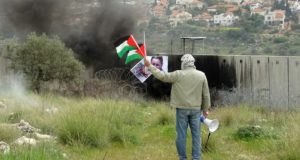 The people of Ni’lin are also not willing to give up their right to stand up against the construction of a Wall that has been declared illegal by the International Court of Justice. The village will not be quiet! The demonstrations organized in Ni’lin were always of a peaceful, nonviolent nature. Each time, the unarmed demonstrators were met with severe force and heavy violence from the side of the Israeli army (often before even reaching the construction site), injuring many Palestinian, international and Israeli participants, even attacking and injuring journalists and medical workers. 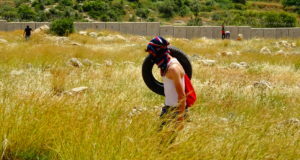 The curfew imposed on Friday 4th of July 2008 was yet another measure in line with the severely disproportionate tactics that the Israeli army is using to slam down the protests and silence the people of Ni’lin, who are merely trying to defend their land and lives through nonviolent measures. The Ni’lin Popular Committee against the Apartheid Wall strongly condemns these aggressive and unprovoked Israeli military policies that have been declared illegal under international law. 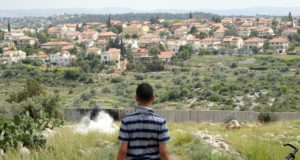 The Popular Committee specifically condemns the recent curfew and siege on Ni’lin, which caused excessive damage and severe injuries in a village that is already being strangled due to the construction of the Wall. *A twelve year old boy was kidnapped from his home by the Israeli army, who kept him hostage for 2 days. *Three journalists were detained for several hours while trying to report on the situation of Ni’lin. The Ni’lin people are calling for local, regional, and international support to sustain solidarity with the village. This support is very much needed. The Popular Committee would also like to take this opportunity to thank everybody who participated in the demonstrations and for all the efforts individuals have put into advocating for Ni’lin, contacting political representatives, and drawing worldwide media attention. We cannot express enough our feelings of deep gratitude for all of these efforts and the coming efforts too! This Thursday, 10th of July 2008, a monumental protest is organized for the 4th anniversary of the ruling on the Wall of the International Court of Justice. The protest will start at 11 am in front of the municipality of Ni’lin. We will leave Ramallah at 9.30 am from the bus station behind Ziryab. Please confirm your attendance by contacting Hindi: 0599 83 98 43. He is also available for questions regarding the protest or for more information regarding the situation in Ni’lin.